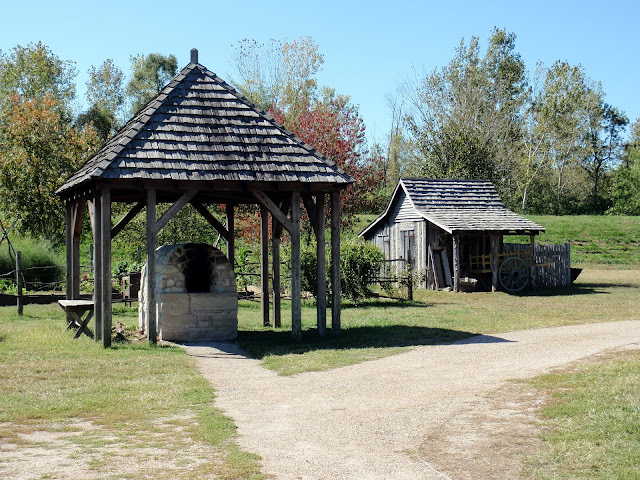 The Digital Research Library of Illinois History Journal™: Fort de Chartres / Fort Cavendish and the Village of Nouvelle Chartres. Fort de Chartres / Fort Cavendish and the Village of Nouvelle Chartres. Fort de Chartres is located on Illinois Route 155, four miles west of Prairie du Rocher, Illinois, the site marks the location of the last of three successive forts named “de Chartres” built by the French during their eighteenth-century colonial occupation of what is Illinois today. Originally, the Illinois Country was under the jurisdiction of the Canadian province of Quebec, but in 1717 it was transferred as a district to the province of Louisiana. The first commandant of the Illinois Territory was Pierre Duque Boisbriant who arrived in December of 1718 with orders to govern the country and erect in the Mississippi valley a bastion to forestall possible aggressions of the English and Spanish as well as to protect the settlers from hostile Indians. With eagerness he started to build the most pretentious in the chain of forts along the Mississippi river (the Indians called the Mississippi, "Sinnissippi," meaning "rocky waters"). Fort Chartres was the creation of the Company of the West, or Mississippi Company, which was organized by the celebrated John Law, in August, 1717, immediately after the surrender by the Sieur Antoine Crozat (Crozat, marquis du Châtel, French founder of an immense fortune, was the first proprietary owner of French Louisiana, from 1712 to 1717.) of his patent and privileges in Louisiana to the French crown. It was named Fort de Chartres presumably in complyment to the Regent of France, from the title of his son, the Due de Chartres. This commercial company and its early successor, the Royal India Company, held away in the province of Louisiana, of which Illinois formed a part for fourteen years. On February 9, 1718, three ships of the Western Company – the Dauphin, Virilante, and Neptune – arrived at Dauphin Island with officers and men to take possession of Louisiana. On one of these vessels, or on the frigate La Duchesse de Noailles, which arrived at Ship island on March 6th following, came Pierre Duque de Boisbriant, a French Canadian, who had been commissioned first king's lieutenant for the province of Louisiana, and who was the bearer of a commission appointing his cousin, LeMoyne de Bienville, governor and commandant general of the province, in place of M. L'Epignoy's removal. In the early part of October, 1718, Lieutenant Boiabriant, with several officers and a considerable detachment of troops, departed by bateau (boats) from Biloxi, through lakes Pontchartrain and Maureeas and up the Mississippi to regulate affairs in the Illinois County and to establish a permanent military post for the better protection of the French inhabitants in their northern district of the province. Arriving at Kaskaskia late in December of that year he established his temporary headquarters, which was the first military occupation of the village. This however, was continued for only about 18 months. Having selected what was considered a convenient site for his post, some 18 miles to the northwest of Kaskaskia, de Boisbriant brought a large force of mechanics and laborers to work in the forest. 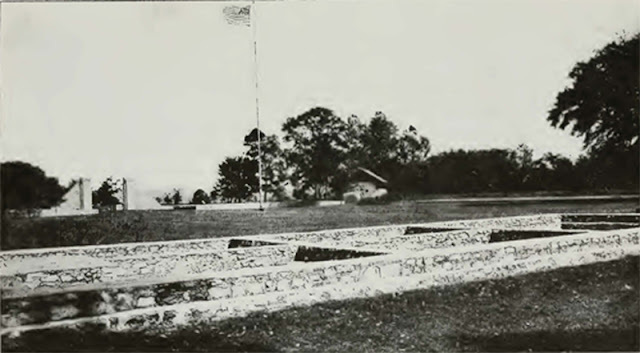 This palisaded log fortification, completed in the spring of 1720 and located on the Mississippi river about sixteen miles northwest of Kaskaskia, served as the headquarters of the company, the civil, military and the marine government authority of the Illinois Territory. Its erection was meant to pursue three economic goals set by the company: to facilitate the fur trade, to kick-start lead mining, and to develop regional agriculture. The company decided to build the new fort between two villages, should they ever need to quickly intervene in either place: Cahokia to the north, Kaskaskia to the south. Its construction, led by Captain Pierre Dugué, sieur de Boisbriant and first lieutenant of the king, was fairly rudimentary. Its shape was rectangular with two diagonally opposed bastions. Its wooden palisade, measuring about 190 feet on each side, was surrounded by a dry moat. This fort contained only three buildings, lodging up to about one hundred men. The fort stood on the alluvial bottom (sand, silt, clay, gravel, or other matter deposited by flowing water, as in a riverbed, floodplain, or delta. Alluvium is generally considered a young deposit in terms of geologic time.) about 3/4 of a mile from the Mississippi River and near to an older fort that had been erected by the adventures under Crozat. Midway between it and the bluffs on the east extend a bayou of lake which was supposed to add to the strategic strength of the place. The fort was built of wood and was a very considerable size, but whether it was furnished with bastions or not is uncertain. It is described as a stockade fort, fortified with earth between the rows of palisades. Within the enclosure were erected the commandants house, the barracks, the large storehouse for the company, etc., the same being constructed of hewed timbers and ship-sawed planks. Although not a strong fortification, except as against Indian attacks, it was made to answer for a full generation the needs of its builders and its commandants who successfully ruled here. It formed, moreover, an important link in the lengthened chain of French posts stretching from eastern Canada to the Gulf of Mexico. The idea of this long line of military and trading posts appears to have originated in the fertile brain of that explorer, René-Robert Cavelier, Sieur de La Salle (or: René-Robert de La Salle). Poor maintenance and frequent flooding caused this fort to be abandoned. Two chapels, one in Prairie du Rocher, and the other in St. Philippe, were managed by the parish of Saint Anne which, in turn, was alternately run by the Society of Foreign Missions, Jesuit, and Recollect missionaries. Unfortunately, the fort, constructed at a “musket's shot” distance from the Mississippi river, was regularly flooded by rising waters in the spring. Consequently, the first fort was only used for a few years before being replaced. Shortly after the completion of the fort, the Louisiana government founded a village that shared the same name outside of the fort, Nouvelle Chartres in 1720. 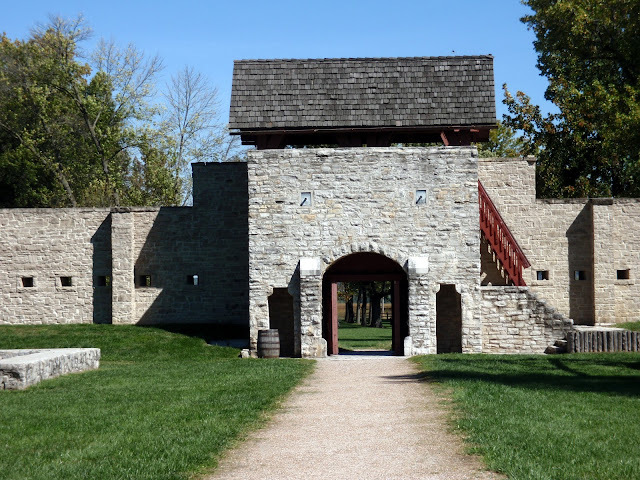 Contrary to New France's, Fortress of Louisbourg (in Canada), or Fort Michilimackinac in today's State of Michigan, the inhabitants did not live within Fort de Chartres. Settlers from Canada and France, confident of protection, arrived and clustered near the fort. They wondered whether the native Indians could be trusted. While the local Metchagamia tribe in the vicinity of the fort proved to be anything but warlike, in 1729, the Natchez Indians, provoked by the tyranny and greed of the French commandant, Chobart – incited a conspiracy against the French. Massacres were frequent. 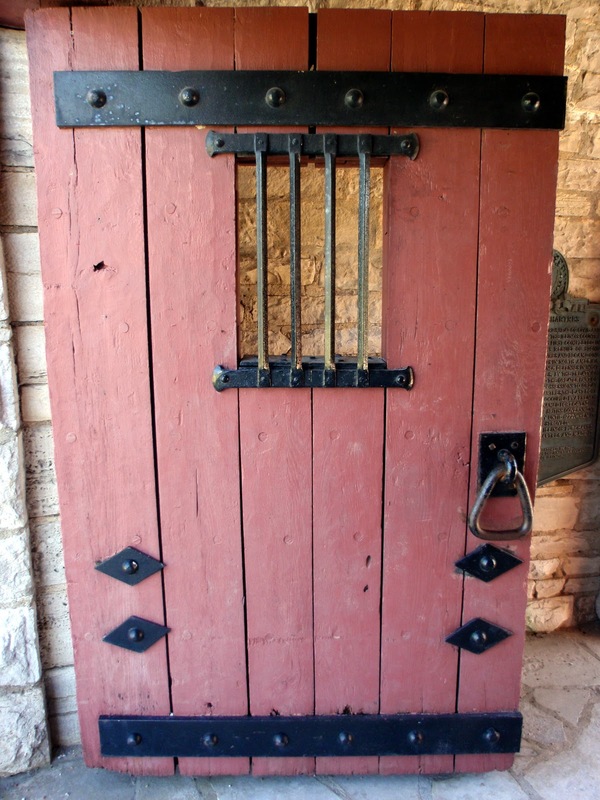 In 1736 the garrison of Fort Chartres marched against the Chickasaw Indians, who threatened to cut communications between the Illinois Country and the city of New Orleans. The focal point of this little French community of Nouvelle Chartres was the parish church of St. Anne du Fort de Chartres. In 1752, Commander Jean-Jacques Macarty's census tallied the population to 198 French, 89 black slaves and 36 panis (native) slaves. Thus, the population of the Village of Chartres was classed third in importance after Cahokia and Kaskaskia. The fort itself could accommodate up to 300 soldiers. The village of Chartres disappeared shortly after 1765 making way instead for the parish of Saint-Joseph in Prairie du Rocher, which still exists to this day. The second fort was constructed sometime around 1725. Erected in proximity to the first fort, it was a little smaller than its predecessor but it included four bastions. A small chapel and a hospital were constructed outside the palisade. Just like the first fort, it often flooded. After the West India Company's failure to find gold and precious minerals, the government of New Orleans took control of the region and the fort. The decrepit state of the fort forced the garrison to move to Kaskaskia in 1747. Though the land exploitation never yielded precious metal deposits, the region turned out to be an important source of lead and especially of fertile ground that was favourable to agriculture. 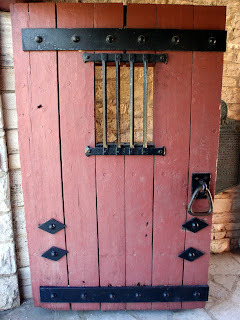 Fort de Chartres' gate. Note that originally, the entrance faced the river, while that of the rebuilt fort faces away from it. The Illinois Country quickly became a sort of “breadbasket to Louisiana." In order to protect commerce and exchanges, the colonial administration decided from then on that a stronger military presence was required in the area. 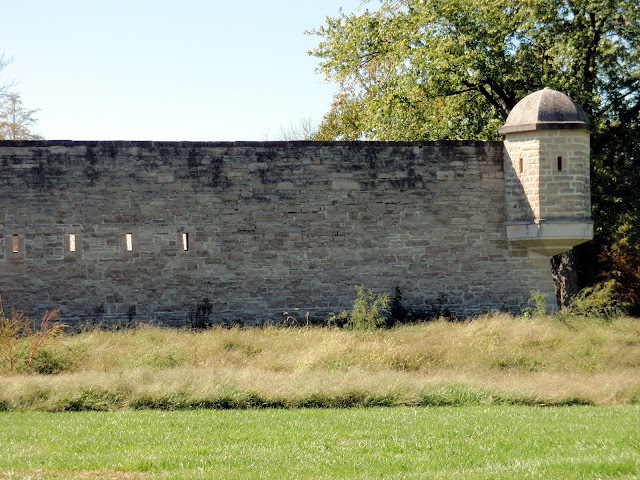 Initially, the government of New Orleans wanted to reconstruct Fort de Chartres in Kaskaskia. Founded in 1703, this community was indeed larger than that of the old fort. 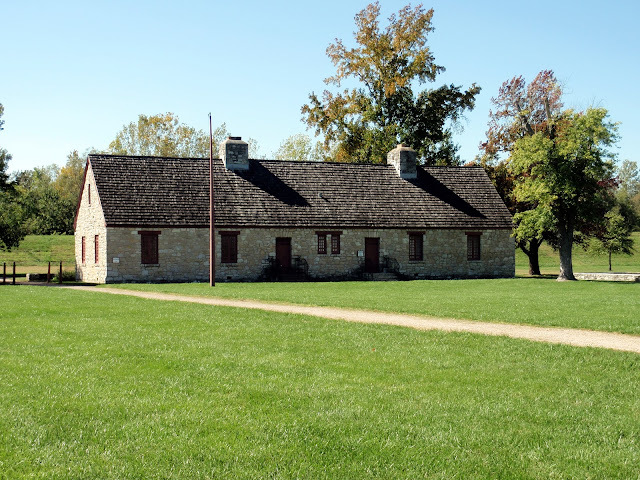 In 1751, governor Vaudreuil decided, however, to leave the administrative center of the Illinois where it then stood. To avoid annual floods, however, it was reconstructed about one-half mile north of the first fort, under the supervision of engineer Jean-Baptiste Saucier. Construction was difficult. The lack of experienced workers and the many desertions slowed the work effort. Furthermore, construction material was brought in from north of Prairie du Rocher, located several miles from the construction site. The cost of construction, evaluated at some $7,750,000, according to some estimates, rapidly escalated to the point where the French crown threatened to abandon the work in progress. The new governor of New Orleans, Louis Billouard de Kerlerec, assured the French minister that construction was nearly complete. In reality, the fort would only be completed in 1760. Although it was constructed out of stone, the new fort was not made to resist grand artillery fire; rather, it was made to resist native sieges. Luckily, despite the apprehensions of Commander Pierre-Joseph Neyon de Villiers, Fort de Chartres was never the target of any English offensive. In theory, should Canada be lost, the head staff of the French army expected to retreat to it with a few thousand soldiers in order to attack Virginia and Carolina. In the end, this plan was never put into action. After the signature of the Treaty of Paris in 1763, officialising the French defeat at the end of the Seven Years' War, Fort de Chartres wound up in British hands. The new occupants of the fort quickly faced the same problems as did their predecessors: disease, in particular malaria, and soil erosion. The British tried different methods to attenuate the effects of the erosion that threatened to engulf the fort, but maintenance costs soon exceded the fort's worth in the eyes of British authorities. Because of the murder of the Ottawa Chief Pontiac, the British renamed Fort de Chartres – Fort Cavendish in October of 1765. The garrison thus abandoned it in 1771. After a severe flood in 1772, Fort Cavendish/Chartres was abandoned forever One year later, the South wall and its bastions collapsed. As for the residents of the East shore of the Mississippi, most moved onto the western shore, which was thought to be more hospitable because of the presence of a Spanish catholic government. 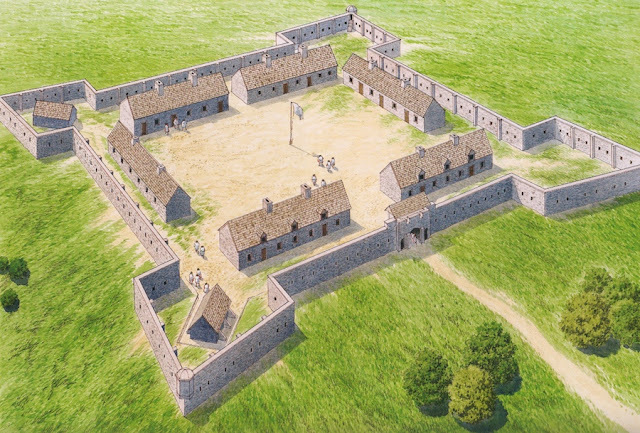 Once abandoned, Fort de Chartres was only occasionally occupied by errant natives. 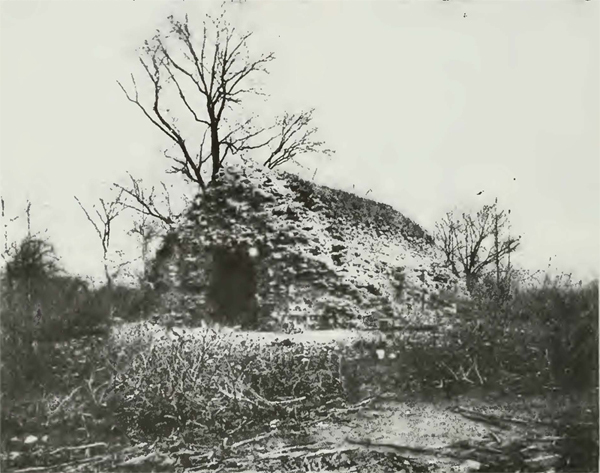 The fort quickly deteriorated and vegetation reclaimed the land; thus, by 1804, about thirty years after having been abandoned, the presence of trees measuring 7 to 12 inches in diameter was reported within the old enclosure. The repetitive scavenging of material from the fort by the inhabitants of neighbouring communities contributed to the gradual disappearance of its last remains. The ruins of Fort de Chartres / Fort Cavendish with powder magazine intact. In 1913, the state of Illinois purchased the nearly 20 acres of land on which the ruins lay, probably giving in to the insistence of certain history amateurs and professionals, like Joseph Wallace who, in his 1904 article, strongly suggested the preservation of this “relic." 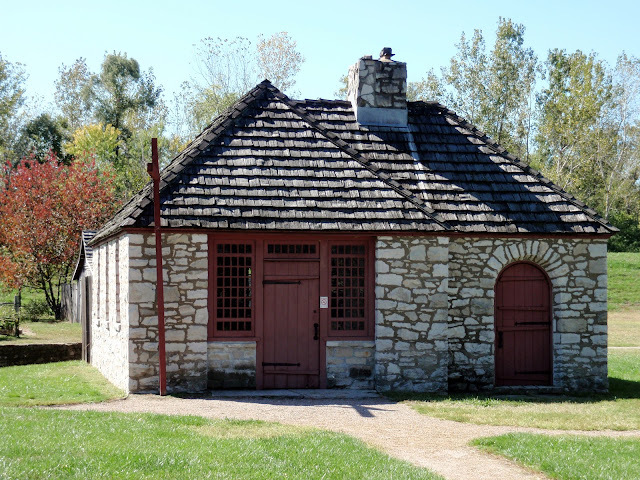 Henceforth established as a state park, work began in 1917 to restore the powder magazine, the only relatively intact structure in the fort and thought to be the oldest military structure in Illinois. The partial reconstruction of the fort, undertaken through a governmental construction program, spread over many years: the storehouse was rebuilt in 1929; the gate in 1936; the guardhouse in 1940; finally, the foundations of anything that wasn't reconstructed were covered with a layer of cement to stop erosion. In 1966, the site was recognized as a National Historic Landmark before being added to the National Register of Historic Places in 1974. Systematic archaeological digs at Fort de Chartres were only undertaken in the 1970's and 1980's. These first systematic digs were held following public pressure insisting that the fort be rebuilt in the most authentic way possible: thus, the North wall was reconstructed during the 1980's on its original foundations. Essentially carried out on the site of the third fort, these digs were followed by a second archaeological search which confirmed the location of the first Fort de Chartres. 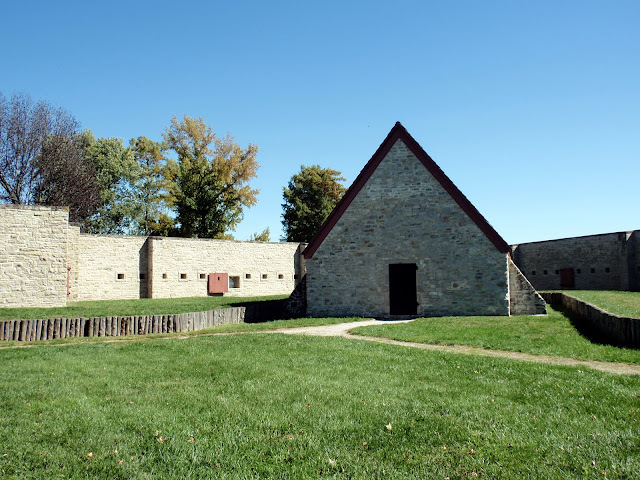 The efforts invested in research and reconstruction guarantee Fort de Chartres' place in the heart of the Illinois Country's French heritage. 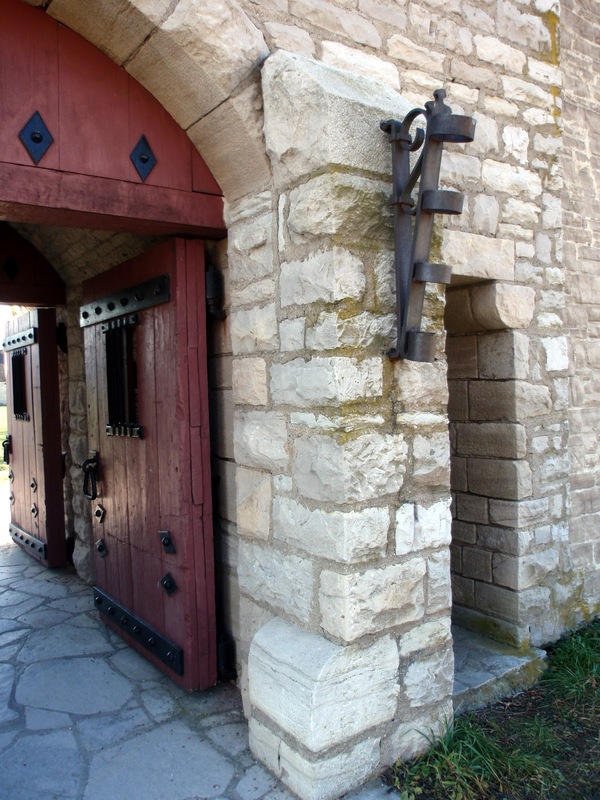 Currently managed by the Illinois Historic Preservation Society, the site is open to visitors who not only have access to its museum, but also to a library dedicated to the history of the fort. Photographs copyright © Neil Gale, Ph.D.